Do not be fooled. I like noodles and pastas of all varieties. Not as much as my husband who will kiss the ground I walk on any time I serve pasta for dinner, but I like them. Especially hand-made, fresh, toothy noodles in almost any Asiany sauce or soup. But I also love making noodles out of vegetables and will toss them in creamy, cheesy sauces, coat them in sticky sweet glazes or stir them into soups. I am also a big fan of pork and anything cooked with a dashi broth. And so for the Food52 Best noodle soup contest, I decided to do simple udon using zucchini and Momofuku-style roasted pork. And dear lord in heaven, it was good. The pork can be made ahead and even frozen, which I think every household should just do. You will probably never, ever be sad to have some variety of wonderful, yet neutral pork you can pull from the freezer at a moment’s notice. I often have carnitas in the freezer and will be adding this slow-roasted, caramelized version to my monthly repertoire. A pork shoulder is rubbed in salt and sugar, plopped in the fridge overnight and then roasted for about 6 hours. You then rub it again with brown sugar and put it back in a really hot oven briefly until the sugar begins to bubble. I can’t reiterate the BRIEFLY enough. I left my first batch in a second too long and the sugar burned into an acrid shell of misery. Please learn from my mistake and just sit and watch it until it is done. The soup is a very simple dashi broth which you can make with seaweed and dried fish flakes or, in a pinch, use the dashi granules that should have permanent residence in your pantry because they are so very magical. The dashi is given a little sweetness and depth with some soy and mirin. 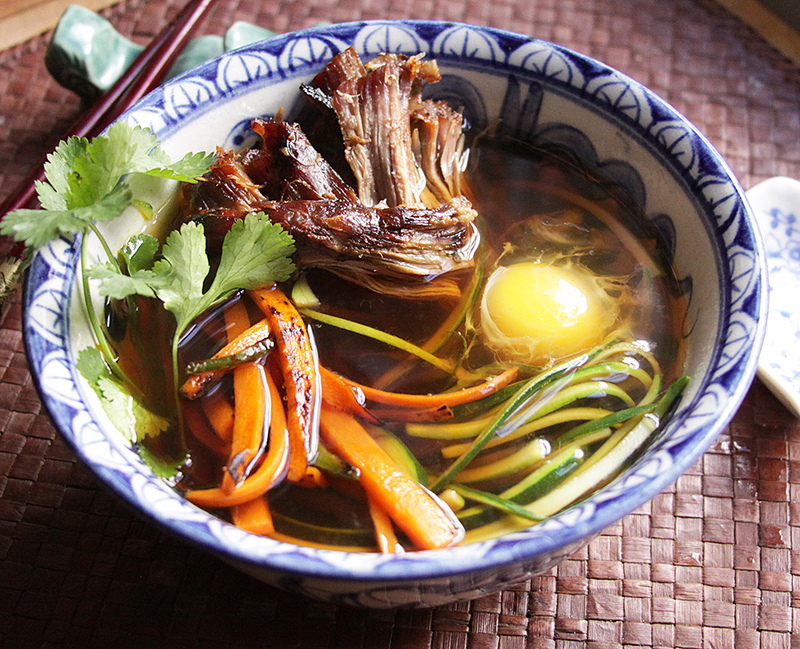 I love adding some charred carrots and jalapeño which further highlight the sweetness and smokiness of the broth. Finally, the julienned zucchini plays the Noodle and an egg cracked into the hot broth cooks just enough to add a rich, creamy finale of perfection (the egg in this photo had just been added, but I was too eager to eat once the white had set so I did not bother with more photos). There are few things better than a soup like this. Mix 1 cup sugar and 1 cup salt in a bowl. Rub all over pork, wrap in plastic wrap and put back in the bowl in the fridge overnight. Preheat oven to 300, remove wrap from pork, place in a roasting pan and roast about 6 hours or until meat pulls easily apart. Baste with the juices every hour or so. Remove from oven and let cool slightly. Turn oven to 500. Mix brown sugar and 1T salt and rub all over pork. Put back in oven for about 10 minutes until sugar has caramelized. DO NOT WALK AWAY! Burnt sugar is nasty! Cut ends off zucchini and cut into julienned strips on a mandoline or by hand, leaving seeds. Do the same for the carrots and jalapeño. Cook the carrots and jalapeño in 1 T oil over high heat until they begin to blister and get some charred marks. Heat the dashi and add the soy, mirin and sugar. Add the zucchini and cook a few minutes until wilted. Ladle into bowls and crack an egg in each, adding more broth on top of egg. (Alternately you can poach egg separately and add to broth). Add a few pieces of shredded pork, some carrots and garnish with cilantro and green onion. *You can either make your own dashi or use the powdered granules sold at Asian groceries. If you choose to make your own, take one sheet of kombu, gently wipe it with a damp cloth, and soak an hour or so in 4 cups cold water. Gently heat until water almost boils. It will have lot of small bubbles all over the bottom. Skim occasionally to remove any foam. Remove kombu from pot and add 2 cups bonito flakes. Bring to a boil, simmer about 30 seconds, turn off heat and let bonito sink to bottom. Strain through a dampened paper towel-lined strainer squeezing gently. This is just beautiful!!! We’re Denverites too. And foodies. My husband was culinary director at Sato in Vail for many years, and I’m an illustrator. I’d love to see your husband’s furniture too. Does he have a website? Lovely blog, so nice to see a beautiful local food blog! I will mark it.